As part of a franchise agreement to open 100 stores in the Middle East, hospitality company HB Brands, led by founder and Chairman Hamdan Al Bader, is bringing America’s favourite chicken wing brand, Wingstop, to the Kingdom of Saudi Arabia. On 3 July 2017, the first outlet was opened in Riyadh and offers a vibrant, cool and fun place to hang out with friends and family. Serving the best chicken wings in KSA, each item on the menu is made to order and comes with hand-cut fries made fresh from potatoes sourced in Saudi Arabia. Staying true to its Texan heritage, Wingstop’s wings are available in 11 unique flavours to suit all tastes, and the franchise also serves a wide range of drinks and mocktails to complement its delicious combos and dishes. 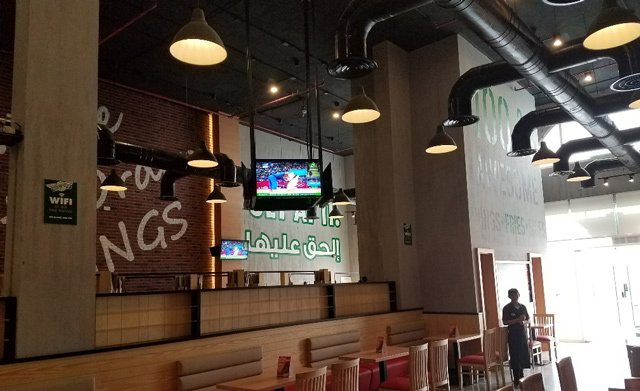 On top of its fantastic variety of chicken wing flavors, Wingstop’s menu is well-priced making it an affordable, family-friendly fast food outlet in KSA. Don’t forget to ask about the Atomic Challenge in store, where your meal will be paid for if you eat 20 wings in under six minutes.